This colorful interactive game brings the joy of a bouncy house together with the world of boxing. 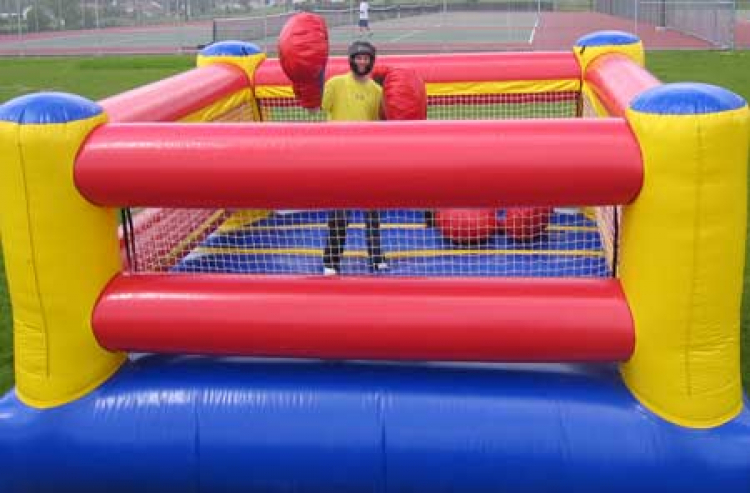 Participants can experience a few rounds in the ring with this inflatable play structure, offering comical and entertaining take on the sport. 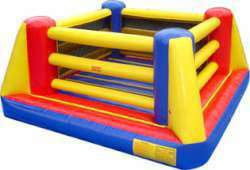 This bright inflatable play structure features a yellow, blue and red motif, with four posts and inflatable "ropes" like a true boxing ring. This one-of-a-kind Box N' Bounce is an inflatable game sure to draw plenty of action at any corporate event, party or indoor playground.This entertaining Box N' Bounce inflatable boxing game is an ideal addition to any outdoor event or Party Rental, and will engage guests young and old. Promote exercise, healthy competition and sportsmanship with the inflatable Box N' Bounce game! This exclusive line of games are made safe and secure with lite n strong, fire-resistant vinyl and come equipped with all the accessories needed for a successful rental product. Price: $199.00 per 4 / hrs.$199.00 per 1 / hrs.